Baroque music – or at least, music from the 17th and 18th centuries – has been getting a lot more exposure in Asia recently. Admittedly, that's building from a base of nothing. For decades Asian audiences – at least those outside Japan and Korea - have rarely experienced in the flesh anything earlier than Haydn, and the fact that we now have a handful of concerts a year which go back a little further into musical history can only be an improvement. Neither the Singapore Symphony nor the Hong Kong Philharmonic do much to explore the area, but at least Singapore has played host to some pretty accomplished period instrument ensembles of late – the most recent being two concerts from the Academy of Ancient Music – while the intermittent events put on under the Baroque in Singapore banner have seen, so far this year, the stunning Lautten Compagney from Berlin present a marvellous show. Visiting Baroque ensembles are no strangers to Hong Kong, either, while the students at the Academy of Performing Arts had a true baptism of fire when they staged L'Incoronazione di Poppea by Claudio Monteverdi back in March. Last weekend the MPO had another bash at a programme of "Baroque bon-bons", and this time it attempted to pull in the punters with a populist programme of Pachelbel's Canon, Albinoni's Adagio (not an 18th century work, of course, but we'll let that one go) and Handel's Largo. 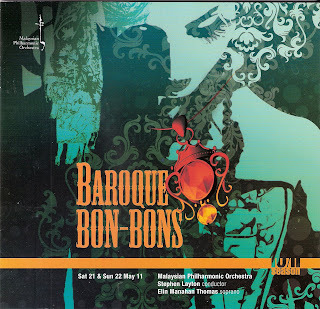 There was even a soprano added to the mix – Elin Manahan Thomas – so, if the KL audience was uncertain of a programme of undiluted Baroque they had something familiar to latch on to. Interestingly, this was the MPO's first official attempt at the ubiquitous Pachelbel; which probably shows how little Baroque music they get to play in a season. On this occasion, however, they fared uncommonly well. There was a mixture of the chaotic and the informal about it when acting (and outgoing) Orchestral Manager, Syafik Afandi found himself on stage explaining a plethora of programme changes for the Sunday afternoon concert. But this only seemed to relax the players, and while the opening Corelli Concerto grosso was, to put it kindly, ragged around the edges, with vibrato-less strings struggling to agree on pitch and ensemble, the spirit of the playing was far more stylish than they have ever managed before. Steve Retallick's manful cello continuo was impressive, and came pretty close to recreating the impeccably stylish but sadly incongruous continuo work Thomas Hurnick used to offer up in the early days of the MPO. Lone double bass Wolfgang Steicke was a model of discretion and understated depth, giving weight but not significant substance to the underlay. And perhaps most impressive of all was Markus Gundermann who, as the concert progressed, came to exert over the proceedings an increasingly convincing feeling for the idiom. The key to the MPO's rather more successful attempts to sound 18th century on this occasion was British conductor Stephen Layton. He concentrated on lightness of texture and rhythmic vitality, and pared the sound down to an absolute minimum. As a result, for the first time in living memory (apart from when Datuk Ooi Chean See disastrously decided to have her harpsichord amplified above the orchestra) we actually heard the harpsichord, and while its presence was discreet (to put it mildly), it was nevertheless there. Textures were transparent and inner detail exposed because Layton kept the dynamics down, and as a result balance – a perennial problem when big symphony orchestras tackle 18th century music – was good. 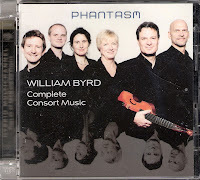 It will take several months of concentrated labour for the MPO to begin to sound passably Baroque but, as Layton himself said afterwards, "they show an openness and willingness to tackle this music which few major symphony orchestras do". For me, though, the most stimulating thing about the concert was the audience response. It is one of the eternally fascinating aspects of concert-going in south east Asia. We get the Hong Kongers' avid enthusiasm for anything with a Chinese face and a complete disregard for everyone else – witnessed by the mass walkout which accompanies the last bar of every orchestral performance. We get the Singaporeans' desire to stand or wave their hands in the air in any performance where more than 50% of the notes are vaguely in tune. But the KL audience has always been a little less predictable, often showing quite remarkable perceptiveness. There was the usual loony in the front who decided to burst into applause (and let everyone know he was doing it) whenever Layton let his hands drop below waist height and the customary row of sullen tarts in little black numbers who weren't going to allow anything to disturb their texting, but this audience was full of surprises. At one point during the Handel Concerto grosso the man in front of me turned round (while the music was in full swing, I hasten to add) and asked if the concertmaster was playing a new instrument because he had "never heard such lovely violin playing" before. Markus has, indeed, changed his instrument recently, but for one of the audience – and not a musician by any stretch of the imagination – to spot it, brought me up short. When I passed on his enthusiasm to Markus after the concert, Markus said that the same man had way-laid him on the way out with the same question; "It's amazing. You play to the same audience week in and week out and never know whether they are hearing anything you do or even listening to you. Then suddenly someone shows that they have incredibly perceptive ears and you realise that it's all worth it". More than that, though, was the audience response to Ms Thomas. Singers usually fire Malaysian audiences with exceptional enthusiasm, and she was no exception, the rousing cheers after a delightful account of Handel's Sweet Bird thoroughly justified not merely for her incredible vocal flexibility and delightfully nimble trilling, but for Hristo Dobrinov's sublime flute obbligato. Yet afterwards the debate was quite heated. Some were ecstatic, pointing to "dazzling technique" and "effortless delivery", while others were not; "Why do the Welsh always sing flat?" was one of the more hostile opinions. For me, her purity of tone was marvellous and her technical delivery of Handel's very difficult lines deeply impressive, but there were intonation problems (Was the orchestra just too soft for her? Did she really need a little more keyboard support?) and a sense that she was reaching the limits of her range both expressively and stylistically. As my man in front commented during the last of the encores, "That was lovely, but not first rate". He may have been talking about the singer, but his ears had picked up on the perfect description of the MPO's latest venture into the world of Baroque music.